The Proline Antennas are available in parabolic and sector models. The parabolic antennas are offered in 1 and 2 ft diameters with gain performance of 24 dBi and 29 dBi respectively. The sector and parabolic units are designed with single and dual-band options such as 2.3-2.7 GHz, 3.5-4.2 GHz and 4.9-6.4 GHz for 2x2, 4x4 and 8x8 MIMO. The sector antennas provide stable gain over wide bandwidths and suppress side-lobes and back-lobes to mitigate inter-sector interference. 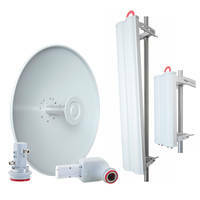 EDMONTON, ALBERTA, CA - KP Performance Antennas, a manufacturer of wireless network antennas, has debuted its new ProLine antennas, a series of high-performance parabolic and sector antennas that are perfectly suited for high-density, point-to-point, point-to-multipoint and backhaul applications. KP’s new ProLine parabolic antennas are engineered to deliver high, stable gain over wide bandwidths with side-lobe and back-lobe suppression for mitigating inter-sector interference. These 5 GHz antennas are available in 1-foot and 2-foot diameters with gain performance of 24 dBi and 29 dBi respectively. Single-band and dual-band options are available in 2.3-2.7 GHz, 3.5-4.2 GHz and 4.9-6.4 GHz for 2x2, 4x4 and 8x8 MIMO. The ProLine sector antennas are specially designed to deliver high, stable gain over wide bandwidths and suppress side-lobes and back-lobes for mitigating inter-sector interference. Single-band and dual-band options are available in 2.3 – 2.7 GHz, 3.5 – 4.2 GHz, and 4.9 – 6.4 GHz for 2x2, 4x4, and 8x8 MIMO. Multiple ports and frequencies in a single radome allow you to integrate multiple radio platforms with a single antenna mounting point, reducing wind load and tower rental costs. “Our ProLine antennas maximize the potential of your radio by improving signal strength and mitigating interference, improving signal-to-noise ratio in your link. The innovative design and unique features of these ProLine antennas deliver price-to-performance value that cannot be beat,” says Justin Pollock, Ph.D., Antenna Engineer at KP Performance Antennas. KP’s new ProLine parabolic and sector antennas are in-stock and can be ordered directly from KP’s authorized distributors or from the KP Performance Antennas website at https://www.kpperformance.com/search?keywords=Proline&view_type=grid.